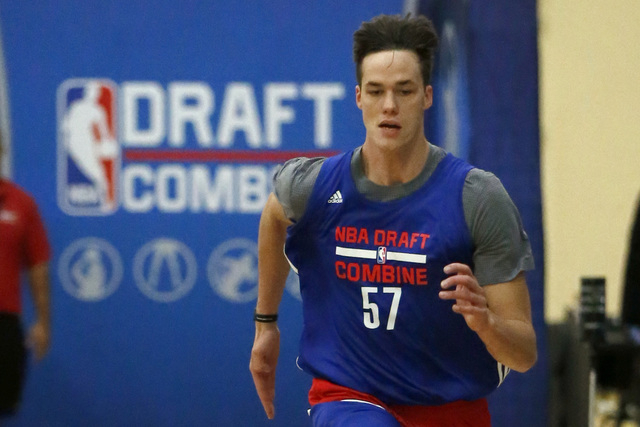 Former UNLV forward Stephen Zimmerman Jr. has been one of the top objects of attention at the NBA Draft combine at the Quest Sports Complex in Chicago, having interviewed with 14 teams. 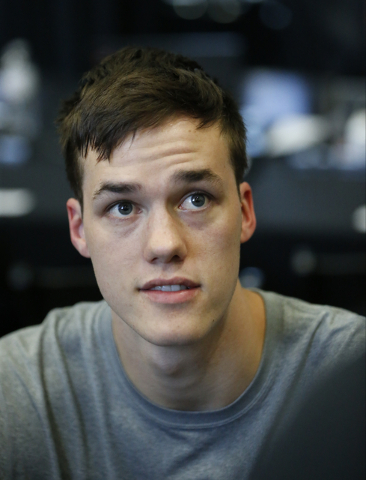 CHICAGO — Though he spent just one year at UNLV, it remains the hometown school for Stephen Zimmerman Jr., and he hopes to return for a couple of basketball games next season. That is, if he can fit the Rebels into his schedule. Zimmerman hopes to be plenty busy at that time, and given that NBA Draft projections typically have him going late in the first round, there’s little reason to think he won’t be preoccupied with trying to make his way as a rookie in the league. 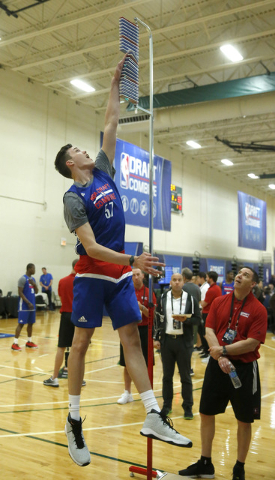 The 7-foot forward has been one of the top objects of attention at the NBA Draft combine at the Quest Sports Complex, having interviewed with 14 teams. Zimmerman said the interviews have been mostly positive, and at UNLV he showed the ability to run the floor and shoot from long range as well as protect the rim. He averaged 10.5 points and 8.7 rebounds and was named honorable mention All-Mountain West by the media. But the major concern is the health of his left knee. He sprained it Feb. 6 at Fresno State, forcing him to miss three weeks. Some players might have shut it down at that point, but Zimmerman returned to play the end of the season despite the possibility of reinjuring the knee. 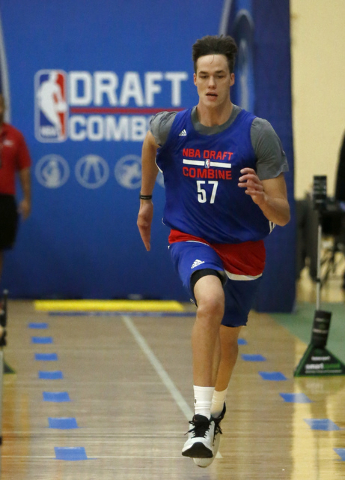 Zimmerman, a McDonald’s All-American at Bishop Gorman High School, was one of two Rebels at the combine. Patrick McCaw, a 6-7 guard, played in one of two games Friday and totaled 14 points and four assists in 22 minutes. Former Rebel and 15-year NBA veteran Stacey Augmon helped both players in their development at UNLV, serving as a UNLV assistant coach the past five seasons. “I think they’re in a good situation,” Augmon said. “I talked to a lot of (general managers) that did their interviews, and they’re very impressed. I think they get a lot of value getting invited here, and really spoke well for both of them. I talked to a lot of guys. All positive. Zimmerman, like many first-round prospects who don’t want to hurt their draft status, didn’t play in any of the four games at the combine because they seldom increase their stock. But he did all the agility drills, and was particularly pleased with his 35-inch vertical leap. Zimmerman also had a 30-inch standing vertical leap. In the three-quarters court sprint, he posted a time of 3.43 seconds, which he wouldn’t have minded if not for a former North Carolina star in front of him. “I was going behind Brice Johnson, and he got a 3.2,” said Zimmerman, smiling. Most draft projections have Zimmerman going in the first round; DraftExpress.com is the outlier that pegs him to go No. 35 to the Boston Celtics. The rest of the projections are fairly consistent, with CBS Sports forecasting Zimmerman to go 25th to the Los Angeles Clippers, Bleacher Report at 30th to the Golden State Warriors, nbadraft.net at 20th to the Indiana Pacers, and HoopsHype.com at 21st to the Atlanta Hawks. Conventional wisdom is a first-round selection validates the decision to leave school early for the June 23 draft, and at this point it seems like the correct one for Zimmerman. “I’ll be able to tell you that after draft night,” he said.